Do you like those niche little items that you can only find at quirky local vendors? Zawadisha’s Annual Holiday Bazaar is one Lake Tahoe annual event that lets you peruse such splendors to your heart’s content. This bazaar features the work of regional artisans, crafters and entrepreneurs, so you can expect to find lots of one-of-a-kind pieces that practically scream your name. And the holiday season is fast approaching, so it’s an excellent time and place to get a little gift shopping done (your sister will definitely love that handcrafted bar of goat’s milk soap for sensitive skin). The best part about this Lake Tahoe annual event is that it benefits Zawadisha, a nonprofit social enterprise that provides eco-loans to women in rural Kenya so that they can access solar panels for energy, clean water and other necessities. 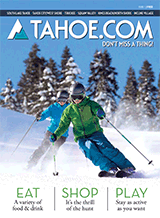 Entry to this Lake Tahoe annual event is free, so just bring your good ol’ self out for a little or a lot of browsing. Zawadisha’s Annual Holiday Bazaar is usually held in late November or early December.